This handy Metro map takes you on a tour of the cheapest rents in the capital. Invaluable for flat-hunters - or anyone curious as to how much their friends and neighbours are paying. Finding a flat in Paris is a challenge, particularly if you're on a budget. But this map (see it in full size here), created by Paris magazine StreetPress and rental trackers RentsWatch, can offer some insight into how monthly rent prices vary dramatically across the city. RentsWatch analyzed thousands of flats, collecting data from over the past six months from estate agents, Internet advertisements and personal experience, which was verified to stop scam or fake adverts skewing the averages. 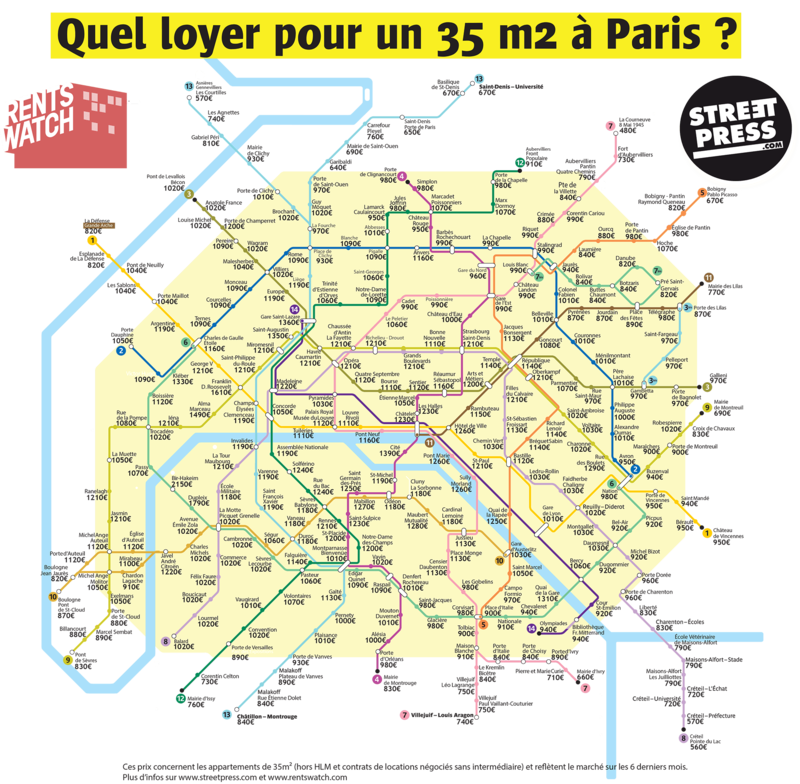 The map shows you how much you'll get for a 35m² apartment within a 500-metre radius of each of the Metro and RER stations (excluding social housing). So how do the different areas fare? Having 35m² to call your own will set you back €2,150 if you live near Bir-Hakeim, which is not far from the Eiffel Tower, and which is the most expensive spot in the capital (see map below, top left). But the very cheapest place to live? That title goes to the area around La Courneuve - 8 mai 1945, the only place on the map where rents dip below the €500 mark, with the average flat going for €480. Unsurprisingly, rents tend to take a significant drop the further from the centre you go. But saving money doesn't have to mean a mammoth commute; in a lot of cases, simply moving one Metro station along could save you hundreds of euros each month. For example, an apartment by the Concorde transport hub is a pricey €1,610, but moving one stop in any direction will save you around €500 each month, which could mean the beautiful riverside location of Tuileries. Click here to see the full version of the map. And if you want to compare prices even further afield, check out these similar maps showing rent costs in Berlin and Munich. EDIT: The original map by Street Press mistakenly listed Place de Clichy as the most expensive spot in the capital at €2,160 per month, as seen in the picture below. This has since been modified by the company in a new map, with the figure revised to €930.